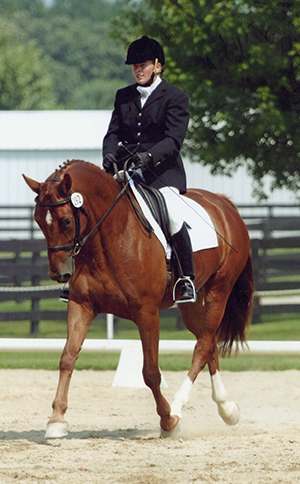 Erinn (Chelstrom) Bieber is a dressage trainer and instructor from Bonduel, Wisconsin where she owns and operates her own training facility, Equestrian Endeavors. She has shown through the levels to Intermediaire I on a self trained horse. She is currently training her second FEI horse whom she purchased as a 2 year old. Erinn has presented many of her own young horses and client’s horses successfully at USDF/USEF recognized shows. She has achieved high-point awards at both Silverwood and Lamplight in the open divisions. Erinn currently trains with FEI Judge and USEF Dressage Committee member Janet Brown Foy and international dressage veteran Lars Peterson. She utilizes the valuable lessons learned from these dressage masters (plus the great foundation gained from being a student of Louis Heyerdahl, Lorinda Lende, Lendon Grey, Betsy Steiner and Lisa Froelig) in the quality instruction of the horses she has in training and with her students. Erinn’s enthusiastic and challenging style of instruction has lead to success at both the Regional and National levels for her students. Several of her students have achieved USDF year-end All Breeds awards, been ranked in the top 25 adult amatueur riders from Training through 3rd Levels, as well as earning the USDF Bronze Medal. Her students and horses have also represented her well at the regional level, with several top 8 placings ranging from Training to 3rd Level, and back to back Regional Champions at Training and First Levels. Erinn has also coached students in the Eventing arena as well, with two of her students participating in the prestigious American Eventing Championships at Lamplight in 2008. Erinn also specializes in matching the right horse to the right rider. Many of her students will attest to how fortunate they have been due to her help in seeking out the perfect equine partner. My 19 year old, retired FEI horse, that I now use for lessons, has been pretty stiff and sore through the last few winters. Even injecting his hocks was not helping anymore. He was to a point that during the winter months, it was getting hard to use him even for easier lessons. 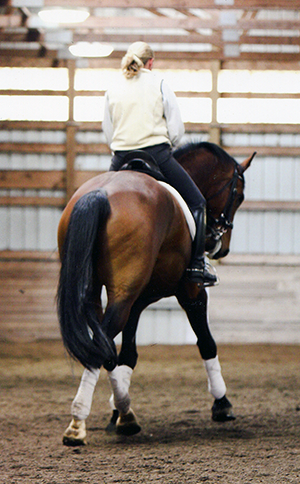 At the start of this winter, when he was already getting stiff, I decided to start him on Impulsion. Within a few weeks, he looked amazing, like we had gone back in time at least five years. Not only does he look good, but he feels good. He is back to his silly, squealing self! I had a training horse come in with a flare up of scratches that had left her very painful and swollen in her hind legs. The swelling didn’t even come down during work or turnout, so I immediately put her on Acute Trauma. She walked out of her stall the next morning with tight, defined legs, and obviously a better attitude, because she felt better. I bought an eight year old green broke mare that had nice gaits, but was a bit on the hot side. She wasn’t really naughty, it was just hard to keep her attention, which made progressing her training difficult. I decided to try her on Impulsion with Composure. Not only did she start to focus, but she now has even better movement than I thought!